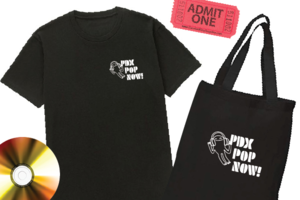 A fundraising campaign for PDX Pop Now! Receive a PDX Pop Now sticker! Your choice of a PDX Pop Now! Tote or T-Shirt! Get one of everything with your donation! It's PDX Pop Now's Sweet 16! For the past 15 years, PDX Pop Now! has been the standard bearer for live local music in Portland, and we need your help to make our 16th annual festival the sweetest one yet! Since our beginnings in 2004, PDX Pop Now! has become one of Portland's longest running music festivals, as well as the one of the only local, all-ages FREE music festivals in the area. Although we are an all-volunteer organization (we have zero salaries, vacations, or offices), keeping the festival free of cost isn't a cheap endeavor, which is why we need your support. You contribution will be put toward the nuts of bolts of the festival: stages, lighting, cables, permits, coverings and sound. In 2018, over 5,500 people from our community attended the PDX Pop Now! festival. If each attendee was able to donate just $6, the costs of the festival would be fully funded! Please consider a contribution to PDX Pop Now! to ensure this Portland summer tradition lives on. 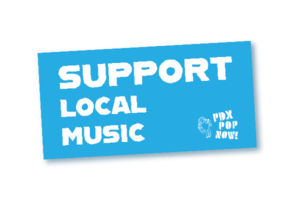 We thank you for your support, and your investment in what we feel is an important piece of Portland's music community! $16 or more: A PDX Pop Now! sticker! $30 or more: Your choice of a PDX Pop Now! Tote or T-Shirt! $50 or more (or a recurring donation of $5 a month): Your choice of a PDX Pop Now! Tote or T-Shirt, admission to our annual Compilation Release show, AND a copy of the 2019 Comp! $100 or more (or a recurring donation of $10 a month): You get it all! A PDX Pop Now! 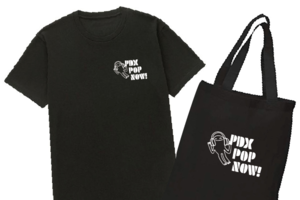 Tote AND Tee, plus a PDX Pop Now! sticker and pin, plus an invitation to our annual Compilation Release show (with plus one), AND a copy of the Comp! PDX Pop Now! is a 501(c)(3) non-profit organization dedicated to stimulating and expanding participation in the music community of the greater Portland, Oregon area. As an all-volunteer organization, PDX Pop Now! produces a free, all-ages festival of local music, a double disc compilation album, outreach efforts in local schools, and local music community advocacy. The summer festival, our flagship program, is an all-local, all-ages, free and geographically accessible showcase of Portland's thriving music scene. Since its inauguration in 2004, the annual festival has grown into the city's premier local music event.